Is your anxiety preventing you from taking care of your oral health? For many people, dental anxiety causes much more than just a little discomfort. Many individuals find themselves putting off appointments, canceling at the last minute, or even experiencing the severe effects of anxiety, such as panic attacks. It's not uncommon to be afraid of the dentist. However, there are ways to effectively manage your dental phobia, and even learn to view a visit to the dentist as a positive experience. We’ll provide you with some tips to help manage dental anxiety and how to improve your oral health without fear! The same mindfulness tactics that help with general anxiety can also help alleviate your dental anxiety. In an effort to stay relaxed, practice breathing and light meditation exercises. It's a good idea to practice these at home before your next dental appointment, so you'll be familiar and comfortable with the techniques when you need them. Deep breathing is an easy, effective place to start. It is important to take deep breaths and count as you inhale, then try to exhale for the same amount of time. You should try breathing in through your nose and out through your mouth. It is a good idea to do this before you arrive for your dental appointment and while you're in the waiting room, so you can take your mind off your fears. Simply sharing your anxiety issues with the dentist can often make the appointment go much smoother. Your dentist has definitely encountered this problem before, so don't be afraid to express your concerns. For example, you might let the receptionist know that you have dental anxiety when you book your appointment. Then, you can talk to the dental assistant about it again when you arrive at the office, so they'll have a plan in place to make you more comfortable. Sometimes it's helpful to mention your specific fears, or any negative dental experiences you've encountered in the past. It is a good idea to work out a signal to tell the dentist when to stop, so you don't feel trapped during a procedure. Don't forget to let your dentist know if you feel any pain - trying to push through discomfort often makes the experience even worse. 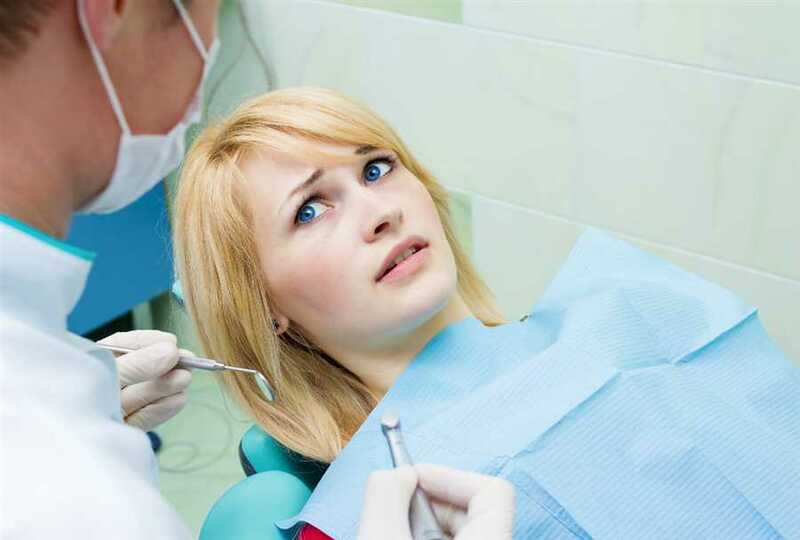 Fear of the unknown is very common, especially during dental visits. If you're not sure what's occurring in your mouth, your imagination can take over and make you fear the worst. In an effort to combat this type of anxiety, simply request for your dentist to describe exactly what they are doing as they proceed with the treatment. Some dental providers have a good routine of explaining what they do throughout the dental treatment process. If this isn’t the case, your dentist might just need a gentle reminder to make you more comfortable. Sometimes the time you spend in the waiting room can increase your dental anxiety. Although it's important to be on time, try not to arrive at the office too early so you won't give your mind excessive time to get nervous about the upcoming appointment. It is a good idea to look for shops or other places in the area, where you can keep your mind occupied until it's time for your appointment instead of sitting uncomfortably in the waiting room. Once you arrive at the waiting room, it is important to take your mind off your anxiety. Many people find it helpful to bring headphones so you can play uplifting music or listen to a funny podcast while waiting to see the dentist. Some dental practices allow you to wear headphones during the appointment to block out any noises that make you feel uncomfortable. Some individuals bring objects to hold, like a fidget spinner or a stress ball, and help reduce the tension. Visualization exercises, like imagining yourself somewhere you enjoy, can also make a big difference in creating an enjoyable experience at the dental office. Another helpful anxiety relieving suggestion is bringing along a companion, who can accompany you in the waiting room and be there to support you when your appointment is complete. It can be helpful to make fun plans for after the appointment, so you'll have something to look forward to after the treatment is completed. If your anxiety is really hindering the way you take care of your dental health, it's a good idea to seek help from a professional therapist. They can help you discover ways to cope with your anxiety that will really help. Sometimes there's a root cause to the fear that you may be overlooking, and you might find it difficult to overcome your anxiety until you address these issues. For many people, the fear of a dental visit stems from a fear of pain. Some procedures are more intense and may involve discomfort or pain. However, requesting that the dentist tell you what kind of pain to expect ahead of time can make it less frightening. You can mentally prepare yourself for the sensations that are coming, instead of just fearing the worst. It's time to stop letting dental anxiety control your life. Your dental health is too important to let anxiety become a barrier. With a combination of the steps listed above, you'll be able to work through your dental phobia. If you have been struggling with dental anxiety or have questions for our dental team, we encourage you to contact us directly at (925) 240-7071. We look forward to making sure your next dental visit is an enjoyable one!